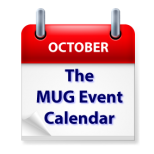 Highlighting this week’s MUG Event Calendar are a visit by Joe Kissell to an Illinois group to talk about digital legacy, and a presentation to a California group by MacPhun of their new Aurora HDR 2018. That same meeting will feature Adam Christianson talking about High Sierra. Other interesting topics on this week’s agenda include ransomware, iOS 11 and Microsoft Office365.